I built my wife a narrow hallway table so she can set her indoor plants on in front of our bay window. It is Japanese style inspired with the extra floating panel beneath the top. I was going to do through tenons on the legs but decided to go for a quicker build. Made out of solid and very heavy Brazilian Cherry. Finished with Sealcoat Shellac and then 4 coats of General Finishes Poly acrylic Satin.Comments and questions welcome! Thanks! This chessboard is based off of a design from Volume 22 / Number 132 (December 2000) of a Woodsmith magazine. I changed the squares to 2-1/4. Made of walnut and hard maple. I made the inlay myself. The dark stripes in it are a rosewood veneer. I chose the rosewood because its what I had laying around. I donated this project for a dinner auction that benefited my kids school. I did not make the pieces…I'm not much of a carver. 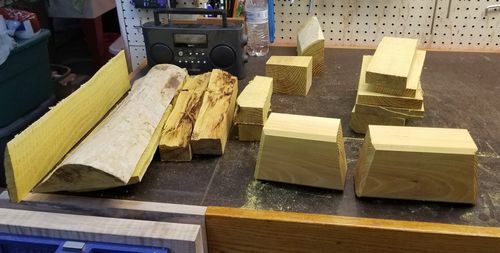 My youngest brother the only one of 6 kids to stay on the family farm was cleaning some fence rows and offered me some osage orange (I had previously asked for some of this extreemly hard wood if he ever came across some. 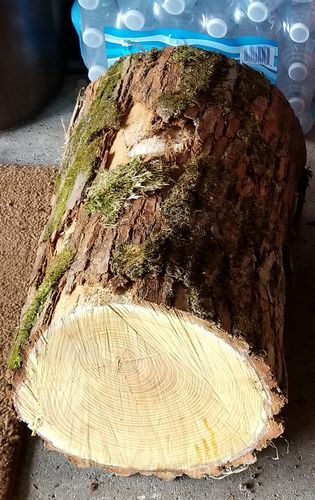 I took an 8 foot log and 2 pieces about 2 foot long and 16 inches in diameter. Sealed the ends. 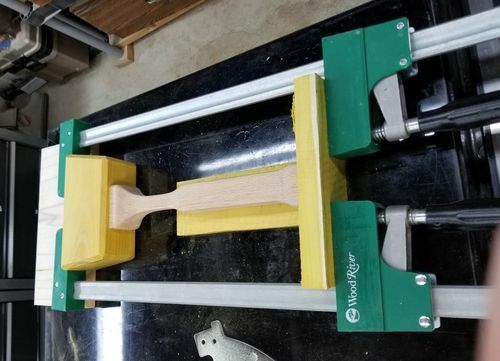 Made a simple jig to hold the larger half as I cut it up on a band saw. Used bench top mortiser for each head and hand chiseled the top end about 1/8th wider along long axis, trimmed tenons to fit heads and used hand saw to create 2 kerfs in the handle tenons. Created some wedges from osage orange scraps. Sorry no photos on this part. When glue dried I hammered in the wedges spreading the handles into chiseled out area. 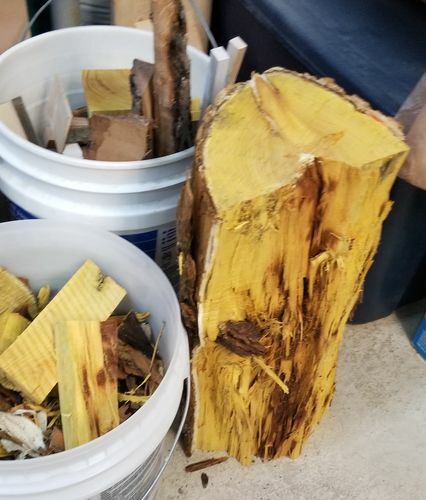 The osage orange worked great as wedges! 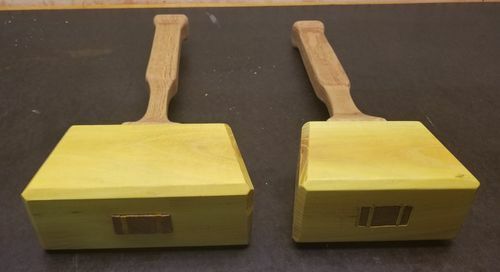 Sanded handles using 120, 150, 180 grits. applied a coat of BLO. Wala – they were done. 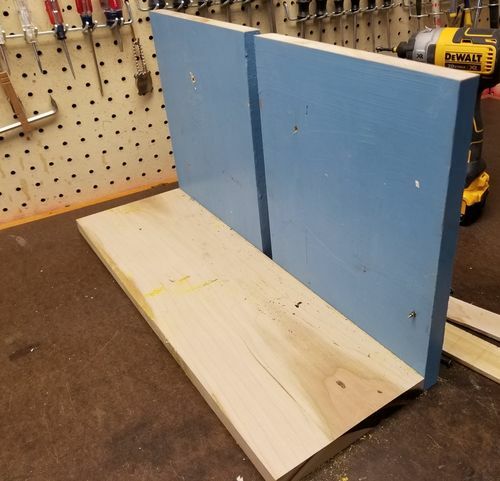 This is (I believe) called a zen shelf I made via request from a family in South Carolina… Not sure what makes it “zen” but the looks is appealing. It was installed in their master bathroom. Wood is walnut. Sorry, the picture is too fuzzy and I don't have another. Basically, the two shelves are tapered from the outside.